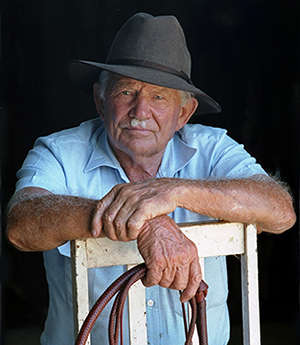 Photographic tribute to Australian legend RM Williams on display at Cobb+Co Museum. One Man’s Mistakes is an intimate portrait of the bushman, businessman, grazier, raconteur, author and one of Australia’s great legends, RM Williams. The exhibition features photographs by renowned Toowoomba photographer David Seeto, who was RM Williams’ personal photographer and friend for more than 20 years. As well as the iconic elastic sided boots, the exhibition also features fascinating insights into RM Williams’ reflections on his life, which he shared with David during the time they spent together. One Man’s Mistakes is based on David Seeto’s recently published book by the same name. The exhibition will be on display at Cobb+Co Museum from 26 February until 12 July, 10am-4pm daily (except Good Friday and Anzac Day). RM Williams spent many years living at Hodgson Vale, just outside Toowoomba. He was passionate about Australian bush culture and handcrafts. In fact he taught Bill Webb, who runs our leatherplaiting workshops, the art of plaiting.